He's back! 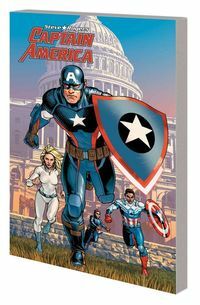 Steve Rogers - the original Sentinel of Liberty - is reinvigorated, with a new shield, a new team, a new mission...and a new secret! Because Steve isn't the only one who's returned. Cut off one limb, and two more will take its place - Hail Hydra! And never in Captain America's history have those two words been so dramatic! But as a resurgent Hydra once more worms its insidious way into Steve's life, he's caught in the crossfire when the Red Skull takes on Baron Zemo! And when Iron Man and Captain Marvel lead the Marvel Universe into CIVIL WAR II, Cap finds himself stuck in the middle again! Can Steve keep the peace as heroes choose sides, tragedy strikes and the trial of Maria Hill begins? Legal Notice: Entire contents trademarked (® or TM) and copyrighted (©) 1986-2019 by Things From Another World, Inc. and respective copyright and trademark holders. All rights reserved. Page rendered at 2019-04-25 00:57:30 in 0.267 seconds.